What is ur favorite sports team, and why? I'll start. Washington Redskins. Da' Bearz always sucked eggs when I was a toddler. Bobby Douglas and Jack Concannon were QB's and Gayle Sayers had just gotten hurt when I was old enough to understand how amazing that man could run. The Pack and Vikings always kicked their arses too, well, everyone usually did. In 1972 my dad went to a Bears-Skins game at Soldiers Field and brought me back a burgundy and gold Skins knit cap. Bearz won 16-15. Butkus caught a TD on offense. George Allen was the new coach of the Skins and Larry Brown reminded me of Sayers. Bill Kilmer threw the ball like a wild goose, but they were exciting as can be. That was it, I decided I had enough of Da Bearz. 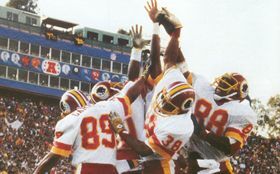 I love the Skins, Doug Williams, Art Monk, George Allen, Joe Gibbs, Charley Taylor, Larry Brown, the Fun Bunch, the Hogs, Darrell Greene and all of em'. Makes me crazy to think of it. 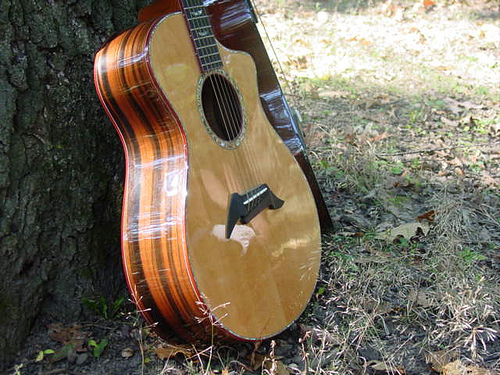 Like smelling a great guitar's soundhole. Re: What is ur favorite sports team, and why? Other than Baseball, I've never been a big sports fan. Football? Ahhh, okay. I was a big basketball fan during the Jordan years, and had season tickets until he retired for the second time. Hockey? Nope. Soccer? Nope Nope. Boxing was always an interest, because I did box in high school. My only real love is for Baseball. I played all the way to semi-pro. Washed out twice, and became an umpire because I loved it so much. It didnt last, and I found myself with better things to do. I'm a White Sox fan, but I dont hate any team. Not even the Cubs. "Baseball been berry berry good to me." The Sox were a "forbidden" team in my youth. They have always been the underdog in Chicago, and no doubt, that is part of my attraction to them. It's interesting though, that they are the underdog here, in spite of the fact that they have almost always been the better team. Summer is my favorite time of year, and the White Sox are my favorite team. Why? Because I love Baseball. I live in the Midwest. And I know Baseball. At least I think I do. Opinions vary. Hmmm...as a kid it was the Vikings, North Stars and A's. Sure I liked the Twins but for some reason have always followed the A's. Gave up on hockey completely when Mr. Green sold the North Stars to Dallas. What a jerk. Then I wrote off football when the Vikes lost to NY in the championship 41-0 or whatever that debacle ended at. Used to bleed Purple as they say, no more. I enjoy baseball and it is the only pro sport I will attend as a fan. Twins are ok and I do follow them, but I follow certain players more. I still have my A's cap and when someone asks me how I can wear it, I tell them "With pride." My most memorable game ever is easy for me. San Diego 1984 during Marine Corps boot camp. We attended a afternoon Padre's game and had to sit at attention, no emotions whatsoever unless someone got hurt. No food, no drink...just the game. Late in the game if I remember right Steve Garvey (known for his line drives for those who remember) hit a laser into the opposing pitcher who supposedly had something going with Steve's wife or ex-wife or something like that. Pitcher went down like a sack of hammers and we were allowed to stand up and cheer our asses off. I could be wrong or making it up but that is how I remember it.